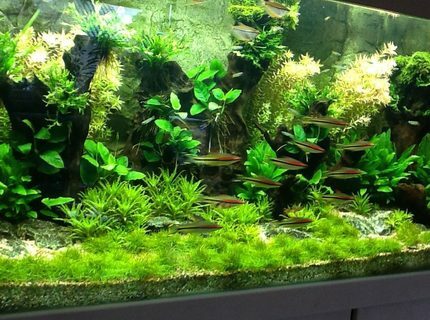 Advice: try new different everytime, but keep same "theme"
Fish Kept: Cardinal Tetra, Dwarf Otocinclus and lots of Red Cherry Shrimps. 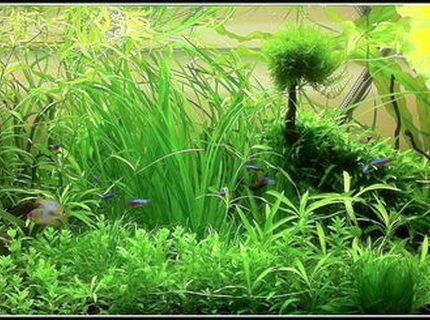 Corals/Plants: HYGROPHILA CORYMBOSA, ALTERNANTHERA REINECKII, HETERANTHERA ZOSTERIFOLIA, CRYPTOCORYNE WENDTII , BACOPA AUSTRALIS, GLOSSOSTIGMA ELATINOIDES, HYGROPHILA POLYSPERMA, FLAME MOSS, SUBWASSERTANG, ROTALA SP. 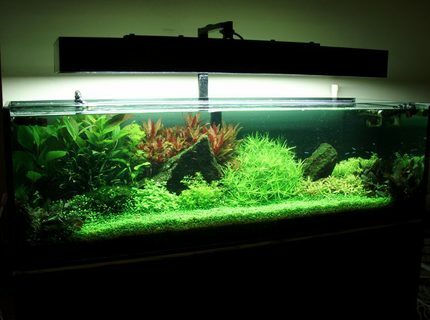 and CABOMBA CAROLINIANA. Quote: To be or not to be. 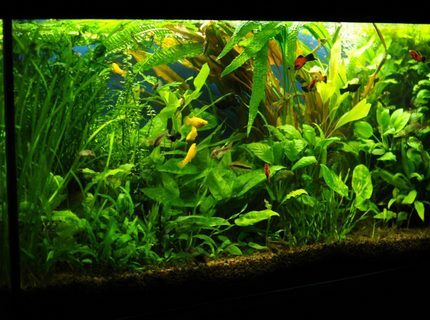 About Yourself: Have been an aquarist for 3.5 years. 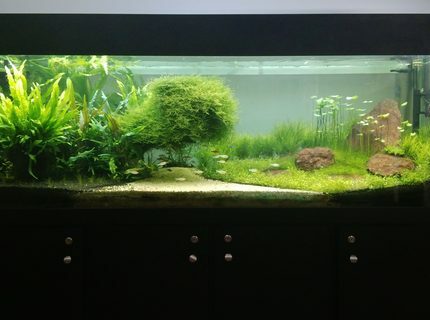 Now venturing in to aquascaping. 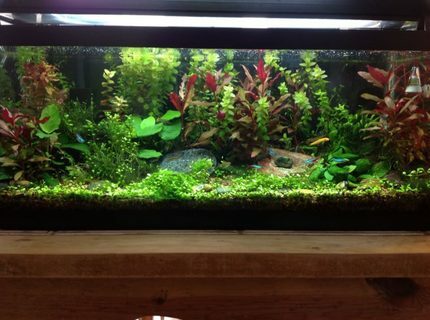 Fish Kept: Bronze Cory Cat, True Rummynose Tetra, Cardinal Tetra, Cherry Barbs, Assassin Snails, Guppy, Otocinclus, Red Cherry Shrimps. 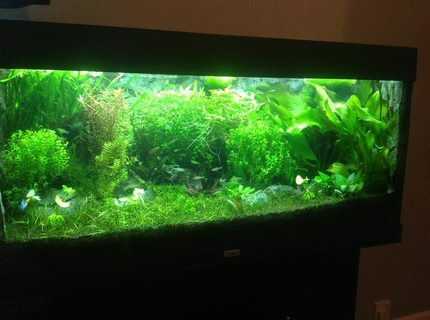 Description: My tank afer 8 months. 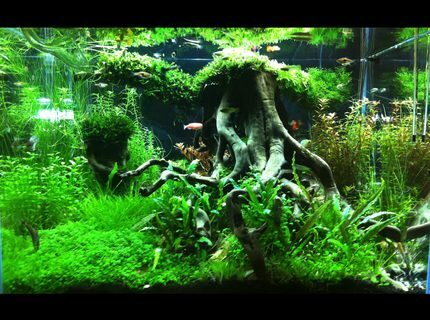 Quote: "Just when I thought I was out, they drag me back in"
Advice: Take your time laying your wood and rocks out, take a week or so to look over your scape before you fill your aquarium with water as you may want to make final changes last minute. Advice: It's quality not clarity. Quote: Everything will be allright. 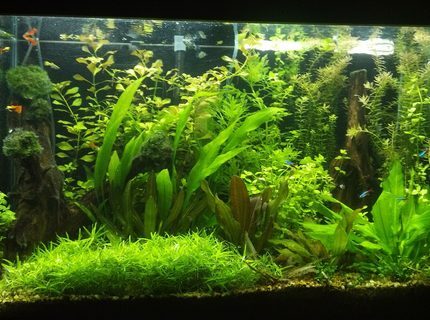 Corals/Plants: Cryptocoryne, Elodea, Pistia stratiotes, Vallisneria, Vesicularia dubyana, Riccia fluitans, Ceratophyllum demersum, Alternanthera, Ludwigia repens, Hydrocotyle leucocephala, Hygrophila polysperma, Echinodorus 'Ozelot' (Green). 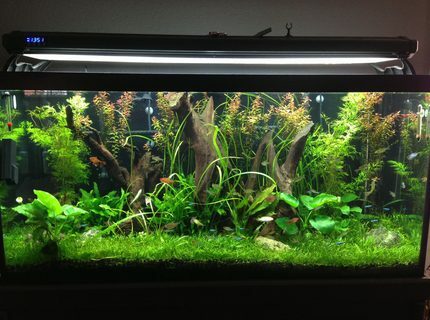 Advice: To have a big aquarium. Description: This is a cleaner version of my previous pic!